The first thing a visitor to the Wexner Center saw up through July 31, 2011, was a sign by the ticket desk warning us of the shock therein, the little trinkets of shock and awe that would overtake us in the galleries below us. The curation of all of the shows I have had the pleasure of seeing at the Wexner Center (aka: “The Wex”) have been truly cohesive, well-conceived, and most importantly, set up with a palpable passion that only adds to the riveting and infectious feelings within an art-loving visitor. There is not tons of space in The Wexner, but each nook is well-utilized in all the exhibitions I have seen there. In the galleries, risks are taken fearlessly. These risks are for the better, especially with exhibitions featuring constantly-white-hot, groundbreaking artworks like the ones in Double Sexus and Human Behavior. The curatorial risks only heighten the artworks while also heightening the general thrill of the exhibitions. 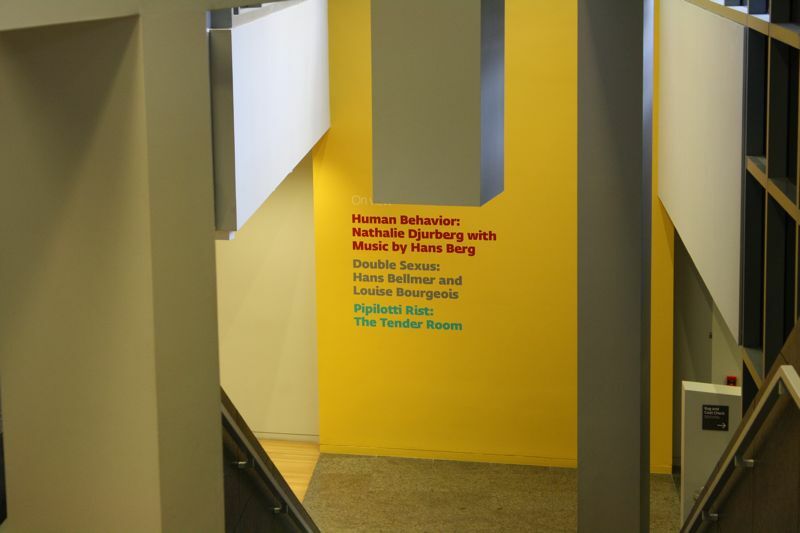 Visitors first enter the Nathalie Djurberg exhibit, Human Behavior, that is spliced (nicely, I might add) with the ambient music of Hans Berg. 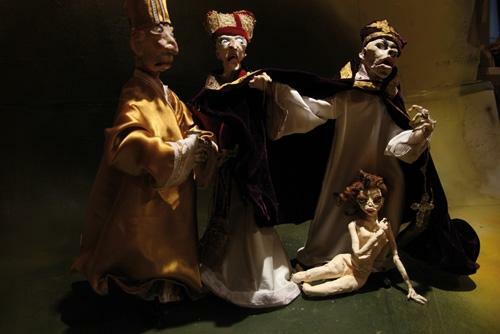 The electro sounds meld perfectly with the stop-motion animation of Djurberg’s disturbing and candy-like puppets and their devilishly didactic tableaux. Djurberg’s ability to create mangled yet oddly aesthetic puppets for her films is expressed very well in the Human Behavior show at The Wexner. The show is also a perfect segue (if there can ever really be a segue) to the Hans Bellmer and Louise Bourgeois show, Double Sexus. The curation of the Double Sexus show was what struck me first, after my initial flitting and pulsating heartbeats of excitement in seeing a gallery of artwork by Bellmer and Bourgeois, two of my favorite artists of all time. The display of the work were mostly on cutaways, L-shaped “walls” that displayed either one, two, or three pieces by the artist. Most of Bourgeois’ works were hanging from the ceiling to a viewer’s eye level, were placed in vitrines or were sculptures on pedestals or on the gallery floor. The point was that, again, as always at The Wexner, the display, the curation was not only chock full of careful considerations, but also overflowing with palpable passion for the exhibition that was coming together. What makes Bellmer and Bourgeois two of my favorite artists of all time as well as two artists whose works have a dialogue that is another artform itself, is the careful passion that is present there in the execution. Bellmer’s Half-Doll (1972) sits in a cutaway in the gallery. She conjures in me an image of a bored little girl. She is faceless. She has one breast and a vulvic crease atop her head. She possesses the usual Bellmer tropes of Mary Jane shoes with socks as well as a bow that signals her as a schoolgirl. Here, she is pictured on a chair that brings to mind a school chair. In the exhibit at The Wexner (I was unable to take photographs in the galleries, so I am improvising with other images), she is sitting on a tall stool. Sitting here she seemed bored, even an outcast bored with the mainstream society that enveloped her whether she liked it or not. On this stool I was reminded of punishment, the act of being removed from the majority, shame, the role of a Dunce in a classroom. 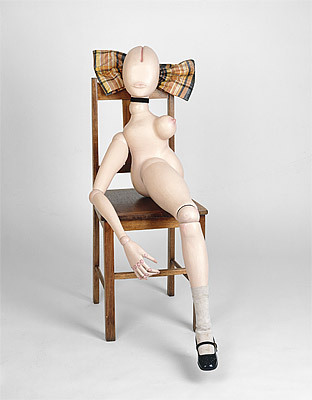 Louise Bourgeois’ fabric sculpture, Femme from 2005 possesses similarities to Half-Doll, though Bourgeois’ is created with more empathy and less anger than Bellmer’s. It is small, unlike Bellmer’s doll, and it sits in a vitrine. The body is a rectangle with a vulvic opening at the far end with bulbous breasts coming up from it. The head comes up from the back of the rectangle, the eyes and mouth deep revines in the pink cotton fabric. The head is sewn in meridians, almost to signal different functions of the mind, a feminist comment fueled with empathy since the femme herself is not an individual, or even truly human. It is, instead, an object. But Bourgeois gave her a mind, a complexity in her objectified simplicity. The show was generally overwhelming, but in a grand way. One could get their rocks off with Bellmer’s pornographic photos that acted as process pieces for his illustrations for Georges Bataille‘s depraved and wondrous novel, The Story of the Eye (Histoire de L’Oeil). One would get their fill of shock, of beauty, of mental and emotional disturbance and intrigue. The show was divided by themes: “Dolls and Prostheses”; “Form / Informe”; and “Doubling and Pairing”. There were stars by each artist within these themes, works that were complete embodiments of these ideas. Both Bellmer and Bourgeois’ use of prostheses in their sculptures (and, for Bellmer, also in his drawings) acted as characters, the synthetic materials of a fake arm or leg actually giving the otherwise de-humanized object an individual humanity. 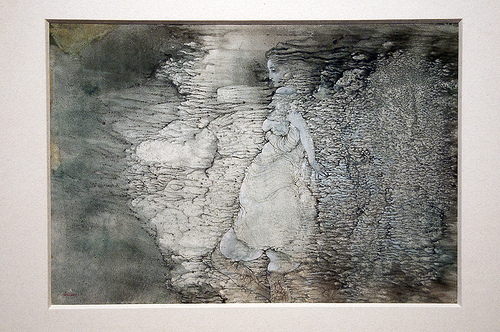 For the theme of “Form / Informe,” Bellmer’s works using the technique of decalcomania where paint is transferred from one piece of paper to another lending to a result of form in formlessness that is perhaps best shown in Between Two Waters (1941), fully embodies this theme. In a nutshell, or more like in a complex hollow of a tree of hundreds of years, Human Behavior and Double Sexus at The Wexner Center illustrated these three artists’ use of the body as a medium, a vessel, to explore gender, corruption, greed, desire, human depravity, sexuality, shame, punishment, as well as loss and autonomy. These exhibitions, by far, by leaps, is one of the best exhibitions I have ever seen. It saddens me that is is over, that it couldn’t be immortal. But I am so thankful and honored that I was able to walk within them and feel them so deeply then and even now. They are still following close behind me and invading my dreams. It is lovely.